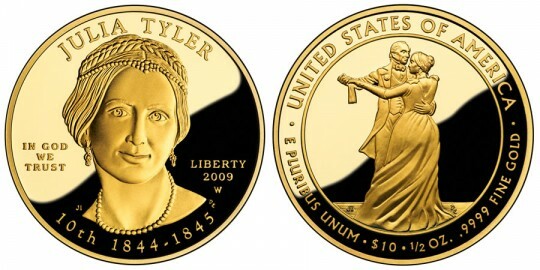 The Julia Tyler First Spouse Gold Coin in proof condition, available August 6, 2009 from the US Mint, is the 11th coin in the 24 carat gold First Spouse Coin Program. This series pays tribute to the first spouses of the United States and recognizes the contributions they made while their husbands served as President. Julia Tyler's reign as First Lady was only a short eight months. She married John Tyler after his first wife, Letitia, passed away. A difference of 30 years of age appears not to have negatively affected their marriage. While First Lady, Julia was helpful in several areas, among them supporting her husband's desire to annex Texas. She also instituted the policy of 'Hail to the Chief' being played whenever the President entered official occasions. Critics of Julia complained that she liked to appear like royalty, but her personality usually won over anyone she met. Also available is the Julia Tyler Coin uncirculated version. Information on both Julia Tyler Coins can be found on the Julia Tyler Gold Coins page at FirstSpouseCoins.us - a World Mint Coins sister site. Designed by Joel Iskowitz and sculpted by Don Everhart, the obverse contains a portrait of Julia Tyler. Also inscribed are the words "JULIA TYLER ", "IN GOD WE TRUST", "LIBERTY", "2009", "10th 1844-1845", and the mintmark "W". Also designed by Joel Iskowitz and sculpted by Don Everhart, the reverse shows Julia and President Tyler dancing. She is attributed with having introduced the polka at a ceremony, and it became a national craze. Included as well are the words "UNITED STATES OF AMERICA", "E PLURIBUS UNUM", "$10", "1/2 OZ. ", and ".9999 PURE GOLD".